Make checks payable to the Red Cross International Fund or the 501(c)(3) of your choice that is helping HAITI. Thank you for your help in this global effort! We delivered the first batch of Haitian relief checks to Terry Burkhart of the Bluegrass Chapter of the American Red Cross this afternoon, collected from across our generous community. Oxfam America, and so many other fine organizations. and organizations to join with matching funds for the need is so great. post an entire list of contributors once we have cleared it with them. Thank you, thank you and more later. If you haven’t had a chance to donate yet, we will continue to collect your contributions – as you can see in the photos and stories emerging from the tragedy, the need is profound. Let’s do all we can. Your tremendous generosity continues to mount! Including our match, Debra and Lowell’s have raised over $9600 in relief from over 100 people. 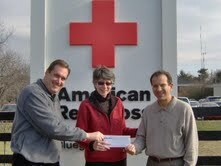 We just delivered another batch of relief checks to the Red Cross this afternoon. If you haven’t had a chance to contribute yet, we are still collecting your contributions. Keep ’em coming! The sense of possibility radiates from his face: He’s leaning forward, ready for anything, eager to engage with the new world awaiting him. Once, we were like Carson is now. We sang without fear. We played with abandon. We learned at incomprehensible speed. We pretended. We asked difficult questions. We created things. We did things. We overflowed with joy. It was (and is) a magical time in a child’s life. And no one “judged” our performance – we were just kids, after all. In this stage of development, only a cruel adult (or sibling) would declare us “bad” at blocks or singing or playing or creating. But then, as we grew older, the regimen of school and critical teachers and vicious peers and numbing conformity drummed a lot of the magic out of us. We became more anxious about singing or playing in public. We became reluctant to stand out. And many of us lost that childish joy associated with learning and discovery. Then we graduated and went to work. And the workplace actively stomped out anything which wasn’t structured and standardized and routinized. Our childish joy was smothered by conforming to the system. But we accepted the slow, imperceptible death of our joy and creativity and genius in exchange for security. Conforming, for all of its flaws, paid us well. Now, those standardized and routinized jobs that we worked so hard to “fit in” to can be (and are being) all-too-easily outsourced to someone else who will do them for less pay and less security. They are too easy to outsource precisely because the jobs are standardized and routinized and dehumanized and documented and commodified. And it becomes a race to the bottom: There is always someone willing to do a standardized job for less. As the economy has disintegrated, millions of jobs are evaporating as they move overseas or are consolidated. And the sad truth is that many of those jobs won’t reappear when the economy recovers. I love books. Especially business books. I have a couple thousand books tucked into the nooks and crannies of my home, my basement, my office, and my Kindle. I also love learning, so the vast majority of my books are nonfiction, and most of them are business-related. There are the software development books, many of which are getting dustier than I’d like. There are the e-commerce books, the career-advice books, the business histories and biographies, the innovation books, the marketing books, the business-strategy books. Nearly every book had interesting information, insights, or perspectives. But only a few really stand out. Once every few years, I come across a book which rocks my worldview, which changes how I approach things and challenges me to do better. Seth Godin’s forthcoming Linchpin: Are You Indispensable? is one of those books. Seth is best known for his contributions to marketing, where he systematically dismantled business-as-usual approaches to marketing. Interrupting and shouting at people (also known as “advertising”) with boring “me-too” products is discredited in large part because of Seth’s creative, insightful writing in books like Permission Marketing and Purple Cow. His blog is a must-read for anyone in business. Many of the themes in Linchpin will be familiar ones to readers of Seth’s previous writing, but the scope and purpose of this book is much more grand (and effective): With Linchpin, Seth wants to do no less than help us change the world. He wants to help restore humanity, creativity, generosity, and artistry into our work and our lives. When we are more human, creative, generous, and artistic, Seth shows how unique and invaluable we become. Suddenly, instead of being another easily-replaced drone in the workplace, we are the critical links – the linchpins – of our organization (and our community). We become indispensable. Standing out is no longer dangerous. Standing out is now the single most effective strategy for not being replaced or being forgotten. Merely “fitting in” – once the source of our security and our income – is now the most dangerous strategy of all. The more we fit in, the easier we are to outsource and the more precarious our jobs become. How do we stand out? By doing original, human, generous work. Seth calls it “art”, which he defines as “a personal gift that changes the recipient”. The way for us and our work to stand out is to imbue it with artistry. Only by adding our personal insight, ideas, innovation, and genius to what we do – only by being more human – can we avoid becoming a disposable cog in the system. Often, we have plenty of insight, and lots of ideas, and a surplus of genius. But we fail to see it through. We fail to produce our art. What stands in the way? Usually, it’s ourselves. More specifically, it is our fear. Fear of failure. Fear of being judged. Fear of being rejected. Fear of success. So we wait. We delay. We procrastinate. We go to the fridge. We scan our email. In the most vital part of Linchpin (and the one which jolted me the most), Seth breaks down what really stops us from becoming great contributors. He shows how we get in the way of our most brilliant ideas or plans. And then he shows why that fear-mongering part of us can’t be tolerated any longer. We must confront our own delay tactics and call out our fears. We must deal with the things which scare us and overcome them. Only then can we produce the art which will allow us to stand out and allow us to contribute meaningfully to our organizations and communities. With his usual compelling and incisive style, Seth names each of these killers of our creativity, shows how they work, and demonstrates how to dismantle them. In a fifty-page tour de force, he decimates the fears which limit our contributions. Ridding ourselves of these paralyzing dread-monsters (or, at least, bringing them down to an appropriate size) allows us to inject some of that creative, playful, innovative, childish joy back into our work. It allows us to connect more genuinely with others. It allows us to change the world. We can attempt to hunker down, fit in, and conform, and live in dread that the economic storm will sweep our livelihood away. We can take control of our careers and our lives to create unique, remarkable, significant work – “art” – and be determined to change the world for the better. One is a passive victim’s path, where the world – and life – “happens” to you. The other is an active, creative, joyful, innovative, human path for those who are liberated to leave a footprint on the world. It is the same path that Carson is on right now. It isn’t really a choice, is it? As I was reading Linchpin, I struggled with how to categorize this remarkable book. Is it a self-help book? A leadership book? A business strategy book? And then it hit me: It’s a Seth Godin book. And it’s his best work. And it will help you change the world – if you let it. As part of our 30th Anniversary, Lowell's gave away 789 free oil changes during the last 3 months of 2009 during our Lowell's Community Service program. In total, those oil changes were worth over $18,500. Community Service was our way to say "thank you" for 30 years of support – and for making Lowell's Lexington's "Best Honest Mechanic" (Ace Weekly's Best of Lex Awards) and "Favorite Auto Repair Shop" (Herald-Leader's Reader's Choice Awards) in 2009.
forward to serving Lexington in 2010 and beyond. Happy New Year!